PAW Cosequin DS Capsules 60 contains a unique combination of natural ingredients, which provides the building blocks for cartilage and joint fluid production. 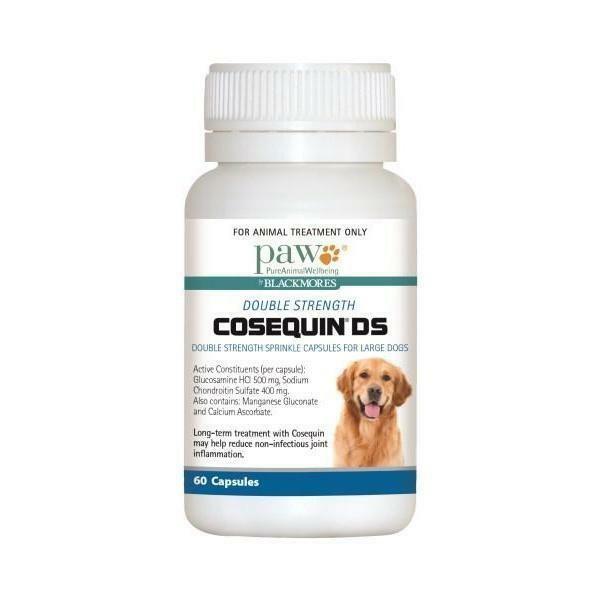 PAW Cosequin Dog DS is a nutritional supplement for cartilage support in dogs with osteoarthritis. The unique combination of natural ingredients used in PAW Cosequin Dog DS provides the building blocks for cartilage and joint fluid production. Cosequin features an exclusive formula that has been shown to be safe, effective, and bioavailable in peer-review, published, controlled, U.S. veterinary studies. It contains 60 capsules. For a 75 lbs dog, you will need to feed 3 capsules daily for the first 4 weeks. After that, it's 2 capsules per day. So you will need 1.5 bottle (84 capsules) for the first 4 weeks and 1 bottle every month after that.